Richard Porter Dillon Jr. (born April 4, 1992) is an American YouTube personality and singer-songwriter. Over his ten years on YouTube, Dillon has amassed over 3.3 million subscribers on his channel, as well as more than 370 million views on his videos. Dillon was born in North Carolina. His family moved to Tuscumbia, Alabama when he was one year old. He has two older sisters, named Tara and Lexi. Dillon attended high school at Hoover High School where he also marched in the band. Dillon then attended college at Auburn University to study film but dropped out after three years. Dillon began his career on YouTube, uploading his first public video to his channel, PICKLEandBANANA, in 2009. Dillon also gained exposure due to the YouTube supergroup Our2ndLife where he, Connor Franta, JC Caylen, Kian Lawley, Trevor Moran and Sam Pottorff went on an international tour and amassed a total 2.7 million subscribers before the group broke up in December 2014. He is also partnered with Fullscreen and has participated in their InTour festival. Dillon uploads original songs and covers, as well as music videos on his channel. He also starred in a scripted Sour Patch Kids series, titled Breaking Out. In 2014, Dillon released his debut single, titled "Ordinary". Dillon's debut EP, titled RPD, was released on January 26, 2015. In July 2015, Dillon released his sophomore single titled "Beat". In an interview with People magazine at VidCon 2015, Dillon hinted towards a new personal song called "Gold", told to be featured as one of the tracks on his second EP. Dillon has mentioned in multiple interviews that Demi Lovato is a major influence to his musical career. He has covered several of her songs on his YouTube channel some of which were released to iTunes. On December 1, 2015, Dillon announced the release of his debut album Gold, which was released on January 15, 2016. The 10-track set (produced by Bobby J Frausto) is preceded by the lead single "Steal the Show" (featuring Trevor Moran) released on December 28. Snoop Dogg and fellow YouTube personalities Trevor Moran and Shelby Wadell are featured on the album. The music video for the second single "Problematic" (featuring Snoop Dogg) was released on January 15. Dillon, who has previously dated both men and women, posted a video in September 2016 entitled "My Sexuality", in which he said that, "If I were to label myself, I would be the closest to asexual." 2014 N/A Episode "More Bad than Good"
^ "Ricky Dillon on Twitter". Twitter. ^ "Draw My Life: Ricky Dillon". YouTube. Retrieved September 8, 2016. ^ Stone, Madeline. "Meet Ricky Dillon, The Amazing 23-Year Old YouTube Star With Millions Of Fans". Business Insider. Retrieved December 25, 2014. ^ Spangler, Todd. "JennXPenn, Connor Franta and Other YouTube and Vine Stars Featured in Fullscreen's First In-Real-Life Festival". Chicago Tribune. Retrieved December 25, 2014. ^ Gutelle, Sam. "Ricky Dillon, Andrea Russett Star In Sour Patch Kids' Scripted Series". tubefilter. Retrieved December 25, 2014. ^ Anitai, Tamar. "Ricky Dillon's Got His Cheap Shades On And Is Ready To Party In The Pool In His Star-Studded 'Ordinary' Video". MTV. Retrieved December 25, 2014. 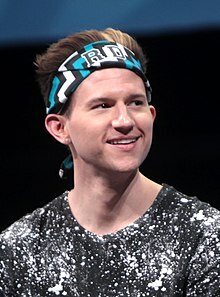 ^ "Ricky Dillon Details Upcoming Debut EP". fuse. Retrieved December 25, 2014. ^ Frere, Jackie. "YouTube Star Ricky Dillon on New Single & Success: 'It Kind of Freaked Me Out, But in a Good Way'". Billboard. Retrieved 24 July 2015. ^ Emmanuele, Julia. "Ricky Dillon Reveals How Miley Cyrus Inspired His New Music Video at VidCon". People. Retrieved 24 July 2015. ^ Grassullo, Stephanie. "The Next Big Star is Actually One of Your Favourite YouTubers!". Teen.com. Defy Media. Retrieved 11 August 2015. ^ "Ricky Dillon - Chart history | Billboard". www.billboard.com. Retrieved 2017-02-15. ^ Ricky Dillon (1 December 2015). "SO I MADE AN ALBUM..." – via YouTube. ^ Ricky Dillon (7 September 2016). "My Sexuality" – via YouTube. ^ a b c d e "Ricky Dillion – Chart history". Billboard. Retrieved 22 October 2016. ^ Dickey, Josh. "'Our 2nd Life' Documentary Will Go Inside the Lives of the YouTube Supergroup". Mashable. Retrieved December 25, 2014.